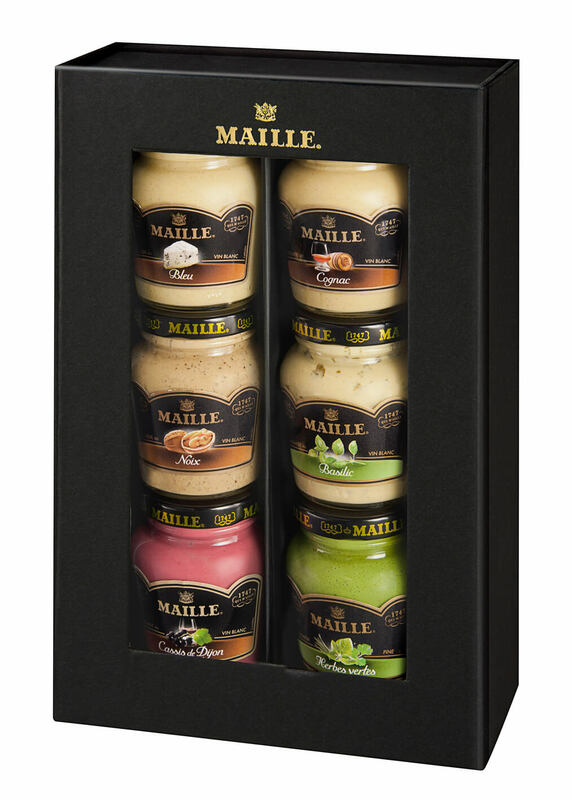 I was recently contacted by Maille, who asked me to review a gift box of their premium mustards. What better way to review a product than to try it in a recipe and see how it stands up to my Savoury Crumble with Mustard? To be brutally honest with you, I’m not a huge fan of mustard. I prefer whole-grain mustard, with a little bit of honey with ham, pork and sausages but that’s the height of it. I find it a little too peppery for my tastes and very strong. In fact, I left a jar open by mistake the other day on the sideboard and discovered my nose and eyes streaming as a result. They are beautiful colours and highly scented with their core ingredients. So I put them to the test by making a warming savoury crumble with mustard (the Williams Pear jar). It added just the right amount of spice, worked very well with the cheddar in the crumble topping and balanced the roasted root vegetables. Pre-heat a (fan) oven to 180 degrees Centigrade. Cube the carrots and turnip into dice sized pieces and finely shred the onion. Toss the vegetables in the oil and place into a heat-proof oven dish. Bake in the oven for 25 minutes. Combine the cheese, mustard and breadcrumbs using a fork. After 25 minutes, sprinkle the crumble mixture over the top of the roasting vegetables and return to the oven for a further 20 minutes. Maille have generously sponsored a prize of a classic collection gift box (see below) fit for a party table for one of my lucky fans. All you have to do to enter the giveaway is to comment below what you like to eat with mustard! The giveaway will end at 11am on Tuesday 24th December. The winner will be contacted directly for the purposes of the giveaway only. Maille will ship the prize directly to the winner. Canvassing, duplicate entries etc will disqualify the entrants. This give-away is open to entrants in the UK and Ireland. Disclosure: I received a gift box from Maille UK for the purposes of this review. Toasted ham, cheese and tomato is lovely with Dijon…..
A variety of mustards would be terrific. I use them in all sorts of sauces and dressings. Hot wasabi on fesh tuna, a spoon of mediium strength with vinegar and olive oil or add a spoon of grainy mustard to a beef and Guinness stew – there’s always a few different jars open in my fridge. I was just thinking the same myself! I eat wholegrain mustard by the tablespoonful with any kind of roast joint. It’s also great on ryvita with roasted peppers, red onion and courgettes! A fan of strong flavours I see? Mustard and baked ham is delicious. It’s lovely added to a white sauce. I love Mustard!! It’s great with pork. But I love a nice chicken sandwich in a baguette with mustard!! Heaven!! 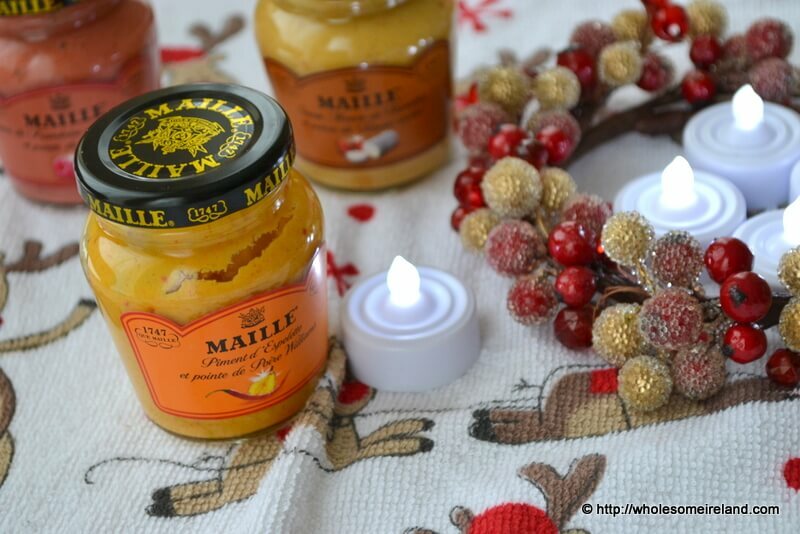 Maille is my favourite brand too! Roast duck, confit potatoes, green beans and dijon mustard. Yeah, duck can be a bit dear (Worth looking out for in Lidl, though) but it’s an amazing ‘special occasion’ meal. Confit potatoes are incredibly easy too. Hi Gillian, yes mustard in white sauce adds a great zing! I love the Maille wholegrain version myself, it’s always in the fridge. Best of luck Peggy! Great idea on the sambos Judith! Mustard is a standard foodstuff in our house. There are a million jars (or so it seems) cluttering up the countertop and fridge! Ah sure a box extra wouldn’t go astray I suppose. Best of luck! Mustard on meat sandwitch and mustard with soya sauce for suchi. I make a lovely pork and mustard dish! Pork & Mustard are a classic combination alright. I am a big fan of mustard with baked honey glazed ham and i love sausages with mustard – it really adds that extra something to all my favourite meats! Ah yes, honey & mustard on ham. Fab. Woah another vote for strong flavours with ryvita! and now its time for me my sandwich of turkey ham and mustard ! and a mug of tea , and put my feet up and relax ,while watching something funny on tv ! Great little ditty. Best of luck! Oh? instead of wasabi? Great idea! Picture this then: toasted Guinness bread spread with marmite, Dijon whole grain mustard & topped with cream/cottage cheese & tomato! In fact, try toast spread with a hot mustard, crunchy peanut butter and chunky marmalade – heaven! I think I’m going to have to take your word for it on the mustard, peanut butter & marmalade combination! It’s like a sweet & sour satay! Might try blitzing it & using as a coating/dip! Love mustard on ham when making sandwiches. Also love to make a dijon mustard marinade for either pork or chicken. Mighty tasty. Nothing beats a smoked ham granary bread sandwich with a generous spread of mustard! Well maybe a big mug of tea on the side? I couldn’t live without mustard! Love the stuff and I completely get why Nigella carries a pot around in her handbag. I always have a pot of Dijon in the fridge for salad dressings or béchamel but my favourite way to eat…has to be a soft fresh buttered roll filled with a couple of just-out-of-the-pan sausages and smothered with mustard, preferably on a very cold winter’s night. I mix it with a bit of honey and olive oil and then drizzle the mix on parsnips before roasting them. Delicious! That sounds lovely Maeve. Yum. Love making a pan sauce with dijon mustard to go with pork chops! Well now yes, maybe with a little apple? You can’t beat the classic combination! Now that sounds amazing any time of the day or night.